Back Bay Books, 9780316380591, 240pp. William Watt's wife, daughter, and sister-in-law are dead, slaughtered in their own home in a brutal crime that scandalized Glasgow. Despite an ironclad alibi, police zero in on Watt as the primary suspect, but he maintains his innocence. Distraught and desperate to clear his name, Watt puts out a bounty for information that will lead him to the real killer. Peter Manuel claims he knows the truth that will set Watt free and has information that only the killer would know. It won't come cheap. Manuel is an infamous career criminal, a degenerate liar who can't be trusted and will say, or do, anything to make a buck. But Manuel has something that Watt wants, which makes him the perfect target for Manuel's consummate con. Watt agrees to sit down with Manuel and before they know it, one drink has turned into an epic, forgotten night of carousing across the city's bars and clubs that exposes the thin line between a good yarn and the truth. The next time the unlikely pair meets is across the witness stand in court--where Manuel is on trial for the murder of Watt's family. Manuel calls Watt to the stand to testify about the long, shady night they shared together. And the shocking testimony that Manuel coaxes out of Watt threatens to expose the dark hearts of the guilty...and the innocent. 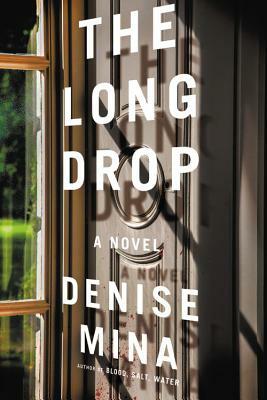 Based on true events, THE LONG DROP is an explosive, unsettling novel about guilt, innocence and the power of a good story to hide the difference. Denise Mina is the author of the novels Blood, Salt, Water, The Red Road, Gods and Beasts, The End of the Wasp Season, Still Midnight, Slip of the Knife, The Dead Hour, Field of Blood, Deception, and the Garnethill trilogy, the first installment of which won her the John Creasey Memorial Award for best first crime novel. Mina has twice received the Theakston's Old Peculier Crime Novel of the Year Award. She lives in Glasgow. "The Long Drop takes readers on a suspenseful tour into the past, through psyches and situations far grimmer than even those sooty Glasgow streets." "Mina has always been a close observer of the brutality drunkards can inflict on their wives and children... this one feels painfully real." "An atmospheric, chilling thriller...The power of Mina's writing is such that she can transport readers from placidity to violent pandemonium in the space of a paragraph." "Mina's riveting sixth novel featuring Glasgow Detective Inspector Alex Morrow...(is) an installment that exposes the bleakness of small-town Scotland as skillfully as it does the bustling mean streets of Glasgow."